Karaoke may never be one of 500 Startups founder Dave McClure’s strong suits, but when he howls along with Justin Bieber, as he did last night after Demo Day, he brings his troops to their feet. If anything, what McClure proves is his willingness not only to invest, but to get his hands dirty in order to help his portfolio companies. 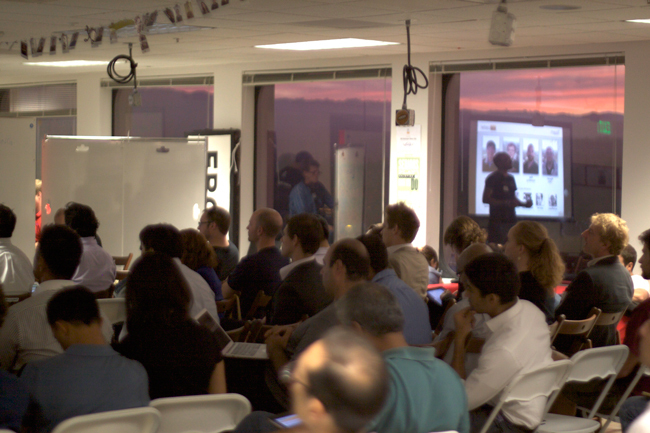 The singalong was powered by SINGBOARD, a web-based karaoke tool that is part of Class 001 of the 500 Startups Accelerator. Fortunately for McClure and his growing roster of startups, his talents are legion. Demo Day is a misnomer. For starters, it spans two days, with much of the news being made on Day 1, as shiny new tech concepts are unveiled to the press and a room full of eager angel investors. However there was still lots of exciting moments to be had, and more than a few checks to be written on Day 2. And while some of the tension had dissipated after opening day, the mood was still electric, as the gorgeous top-floor office in Mountain View once again filled with bodies. Swarthy startup studs shared the stage with mild-mannered engineers whose ideas are too powerful to ignore. Long-haired coders in sandals–or barefoot–mixed with investors in button-up shirts tucked into their jeans, and stunning young geekettes in smart dresses and heels. If there is one thing McClure does well, it’s make startup life look glamorous, and he knows how to scour the globe for top talent. Class 001 is at the vanguard of a generation of practical, lean startups whose mission is to create value in market categories where billions of dollars are at stake, and some may even change the world as we know it. First and foremost, they’re focused on business fundamentals. Demo Day may not have definitively answered the question of whether we’re in a startup bubble, but it came close. Out of a class of 24 burgeoning companies, all but a choice few attacked very serious problems, and did so in a way that will create user value, and hopefully some job growth. Take Daily Aisle, for instance, a company whose aim is to make the wedding industry more streamlined by helping brides-to-be schedule and book venues online. More than 2 million weddings happen in the U.S. each year, and a wedding is one of the largest single expenditures a family will ever make; the average American wedding costs $28,000. The team at Daily Aisle looks to the insurance industry for proof of concept, because like weddings, insurance is a one-time, high-dollar purchase. Daily Aisle, however, creates higher conversion rates, and generates more revenue per customer than insurance vendors. So even ignoring the high divorce rate in this country, they stand to win big. Companies in Class 001 range from the esoteric to the obvious. The Pic Collage photo sharing app from Cardinal Blue is one of the truly innovative uses of the iPad’s large screen, and one that finally measures up to the device’s touch screen potential. Both LaunchBit and ToutApp show serious potential to disrupt the email space. LaunchBit is creating an advertising network that will live inside the 19 billion non-spam emails sent each day, and ToutApp has created templates that will make redundant emails a thing of the past. Tinfoil Security, has huge market potential, even if they’re going into a very mature market segment. The biggest reason people don’t update their security is because they don’t know that they’re pushing out vulnerabilities, says co-founder Ainsley Braun. Tinfoil Security offers a proactive service, rather than a reactive one. Instead of searching for text matches like Google, Tinfoil Security searches for vulnerabilities and issues recommendations before a website gets hacked. Tinfoil Security customers will sign up for ongoing maintenance, ensuring the company has a recurrent revenue model. I predict Tinfoil Security is going to be big, even if it isn’t glamorous. What about the 500 Startups accelerator program would interest two Internet security specialists whose market seems so defined by major players? I wondered. Braun said that because she and her co-founder are from MIT, they’re trained to be obsessed with code and product. At 500 Startups founders are taught to focus on different metrics that can track the customer experience. “We keep ourselves very product-focused, but having someone sit on our shoulder telling us to be design, data and distribution focused has been very helpful,” said Braun. The 500 Startups Demo day was many things, and it provided a fascinating glimpse of the Silicon Valley culture of the moment. A mix of earnest youngsters and seasoned veterans hoping to raise funding rounds of between $300,000 and $650,000 for the next phases of their companies, stands in stark contrast to the startups of old, such as Kozmo.com, which gobbled $250 million before going belly-up with only 40,000 users nationwide. Lean methodology also means that small teams are hoping to create investor value–personal wealth–relying on clever deployment of technology, not necessarily hiring loads of employees. So while 500 Startups accelerator companies may soon be revenue generators, it remains to be seen if they will be prolific job creators. This is hardly their fault. The plummeting costs of server space and the computing power needed to launch a company means that much more can be done with less, and also that the time from idea to execution has shortened too. After Day One of 500 Startups Demo Day, most of the checks had been written, the press had spilled its ink, and the spry entrepreneurs of Class 001 were able to breath a sigh of relief on Day 2. The presentations themselves felt like a mix between a business plan competition, and a night of improv comedy. Some presentations were peppered with swear words, and ManPacks co-founder Andrew Johnson intro’d his by how many men in the audience weren’t wearing underwear. It’s customer development. Honest! And as the 24 startups rattled through their presentations, some from memory, others ad-libbing, the true weight of the task ahead of the many founders seemed very far away. The glamour and attention of the moment erased the memory of the late nights of coding, the pivots and the tasks of acquiring customers that will ultimately determine a successful outcome. An evening that began with noshing on a buffet spread of Middle Eastern staples, hummus, pita and roasted tomatoes, gave way to flowing booze, and a dance party. With Party Rock now blasting through the speakers, McClure exhorted his charges to put down their beers and join the mix. When we had spoken earlier, he told me he had a 6am flight to catch, but that was still hours away. Term sheets would be signed, fortunes made and lost, but not today, now that Demo Day for Class 001 was over.